The Bayshore Heritage Scenic Byway winds along the shoreline of the Delaware Bay from Mannington Township in Salem County to Cape May Point State Park at the southern tip of New Jersey. The route skims the shoreline then moves further inland, crosses over rivers and tributaries and passes through rolling farmland and historic villages. The Byway tells the story of centuries of connections between the communities and cultures along the Delaware Bay and Estuary and the rich and abundant natural resources that support them. The waters, tributaries and related lands of the Delaware Bay and Estuary provide for globally significant birding areas and host vast migrations of shorebirds every spring and fall. Bayshore communities grew and thrived based upon the region's natural resources including fishing, trapping, crabbing, oyster and caviar processing, shipbuilding, iron making, milling, glass making and salt hay farming in addition to traditional agriculture. raptors. For this reason, the Delaware Bay was the first site classified in the Western Hemisphere Shorebird Reserve Network and was dedicated in May 1986 as a site of Hemispheric Importance by the World Wildlife Fund and the International Association of Fish and Wildlife Agencies. Boardwalks and numerous wildlife observation platforms allow viewing access to these wildlife habitats. The Delaware Bay is also home to the largest population of spawning horseshoe crabs in the world. 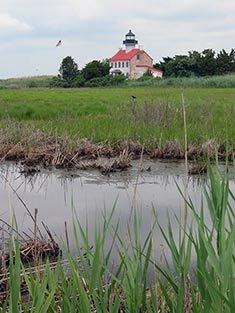 As the Byway traverses Salem, Cumberland and Cape May counties several rivers and streams offer picturesque views and opportunities to experience the birds and other wildlife that reside full-time or seasonally within this unique habitat. The Byway provides access to the Delaware Bay and its tributaries including the Salem River, Maurice River - designated as a National Scenic and Recreational River - and the Cohansey River. Together, these three rivers play an important role in the region's migratory shorebird habitat, threatened and endangered species preservation, economic development and recreational opportunities. Smaller surface waters, such as Alloway Creek, provide additional wildlife and recreational opportunities. 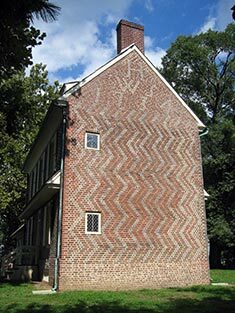 For visitors interested in history there are historic districts in 11 of the communities along the Byway including: Salem City, Bridgeton, Mauricetown, Newport, Greenwich, Dennisville, Eldora, South Dennis, Cold Spring, West Cape May and Cape May. The Byway also includes numerous historic points of interest such as museums of Indian artifacts, revolutionary war involvement such as the Hancock House and Greenwich Tea Burning Monument, historic maritime attractions such as Bayshore Center at Bivalve and Commercial Township East Point Lighthouse, as well as harbor defense with Fort Mott State Park, Fire Control Tower 23 and Naval Air Station Wildwood/Cape May Airport. A more detailed list of historic sites along the Byway can be found in its Corridor Management Plan. This Byway is located in Salem, Cumberland and Cape May counties along the Delaware River and Delaware Bayshore. Begin in Mannington Township at Milepost 1.53 on Hawks Bridge Road/Route 540. Turn right onto Route 45 in Salem and then make a right onto Route 49. Follow Route 49, which turns right onto Front Street/Route 49. Continue straight along Front Street and bear left across the Salem River onto South Broadway/Route 49. Follow Route 49 and make a left onto Freas Road and a right onto Supawna Road. Follow Supawna Road and make a left onto Route 49 and a quick left onto Harrisonville-Lighthouse/Route 632, which will travel through the Supawna Meadows National Wildlife Refuge. Make a left onto Fort Mott Road/Route 630 and continue on Fort Mott Road/Route 630 to Fort Mott State Park on the right. Follow Fort Mott Road/Route 630 and bear right onto Harrisonville Lighthouse Road/Route 632. Turn right onto Route 49 and make another immediate right onto Supawna Road. Turn left onto Freas Road and right onto Route 49 east. Take Route 49 east into Salem. After crossing the bridge over Salem River, follow Route 49 and bear right at Front Street. Continue through West Broadway, right onto Grieves Parkway and left onto Tilbury Road/Route 661. Turn right onto Sinnickson's Landing Road/Route 661. Sinnickson's Landing Road comes to a “T”. Turn right onto Fort Elfsborg-Salem Road/Route 625 and bear left onto Fort Elfsborg-Hancocks Bridge Road/Route 624. Follow Fort Elfsborg Hancock Road/Route 624 as it comes to a “T” then turn right onto Salem-Hancocks Bridge Road/Route 658, which goes over Alloway Creek. Continue on Route 658 by turning left onto Hancocks Bridge/Harmersville Road/Route 658 at the traffic light. From Hancocks Bridge/Harmersville Road/Route 658, bear right onto Harmersville-Canton Road/Route 623. Continue on Harmersville-Canton Road/Route 623 into Cumberland County, where it becomes Causeway Road/Route 623 and Chestnut Road/Route 623. Continue on Route 623 which becomes Ye Greate Street/Route 623. Follow Route 623 and turn left onto Bacons Neck Road/Route 642 and right onto Tindall Island Road/Route 642. Turn left onto Bayside Road, which ends at the Bayside Tract Preservation Site. Take Bayside Road back to the “T” intersection with Tindall Island Road, turn right onto Tindall Island Road and turn left onto Bacons Neck Road/Route 642 into Greenwich. At intersection turn right onto Ye Greate Street/Route 623. Turn left onto Maple Street/Bridgeton-Greenwich Road/Route 607. Take Greenwich Road/Bridgeton Road/Route 607 north toward Bridgeton and turn right onto Sheppards Mill Road/Route 650. Travel to “T” intersection, turn left onto Dutch Neck Road/Route 650, and continue into Bridgeton on Fayette Street. Take Route 49 east over the Cohansey River and turn right onto Grove Street/ Bridgeton-Fairton Road south/Spur Route 609 and continue on Route 553 into Fairton. At “T” intersection, bear right, continuing on Cedarville Road/Route 553. Continue on Cedarville Road/Route 553 which becomes Main Street. The road becomes Cedarville-Newport Road/Route 553. Continue on Cedarville-Newport Road/Route 553 through blinker light intersection. Turn right onto Baptist Road/Route 656 and turn left onto Fortescue Road/Route 637. Follow Fortescue Road/Route 637 bear left at the “Y” to stay on Fortescue Road. Continue on Fortescue Road/Route 637, the Fortescue State Marina is on the right after the bridge. To reach Fortescue and the Delaware Bay, stay on Fortescue Road/Route 637. Follow Fortescue Road/Route 637 north. Turn right onto Baptist Road/Route 656 and return to Route 553, turn right onto Main Street. Turn right onto Turkey Point Road/Route 664 and follow to the end. Turn left onto Maple Street north to “T” at Main Street/Route 553. Turn right onto Main Street/Route 553 and follow towards Port Norris. In Port Norris, turn right onto High Street/Commercial Township 631 to reach the Port Norris Bivalve Spur. Follow High Street and turn right onto Main Street/Route 553. From Route 553 turn left onto North Avenue/Route 649. At “Y”, Route 649 bears right, follow North Avenue/Route 633, it curves slightly to the left. Turn right at the intersection of Highland Street/Route 676, continue along Highland Street and turn left onto Front Street/Route 744. Turn right onto the Mauricetown Bypass/Route 670, which is the Mauricetown Causeway Bridge/Route 670. Turn right onto Delsea Drive/Route 47 south. Turn right onto Main Street/Route 616 toward Dorchester and Leesburg. Continue on this road, it becomes River Road. Continue on River Road as it curves left and becomes Menhaden Road. From Menhaden Road make a right onto Main Street/Route 616 and take south into Heislerville. At the “T” intersection turn right onto East Point Road and turn right onto Lighthouse Road. Return back along East Point Road and stay on Glade Road/Route 616 east, turn right onto Delsea Drive/Route 47 south. Follow Delsea Drive/Route 47 south until intersection with Bay Shore Road/Route 603. Turn right at this intersection and follow Route 603 west towards the Delaware Bay. Veer left onto Fishing Creek Road/Route 639. At intersection with Breakwater Road/Route 613 turn left and follow Route 613 to intersection with Seashore Road/Route 626. Turn right onto Sandman Road/Route 9 and follow to Cape May-Lewes Ferry Terminal. Return back along Sandman Road, turn right onto Seashore Road/Route 626. Route 626 becomes Route 162 as it goes over the canal and then changes back to Route 626. Continue south on Route 626 until intersection with Sunset Boulevard/Route 606. Turn right onto Sunset Boulevard/Route 606. Follow Sunset Boulevard/Route 606 to end of road. Return back along Sunset Boulevard to Lighthouse Avenue/Route 629 and turn right just east of Milepost 1. 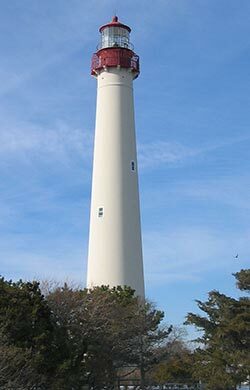 Follow Lighthouse Avenue/Route 629 to Cape May Point State Park.